For years I have - 1. Analyze Drive 2. Defrag Drive under Action and all went OK to defrag.. But now, it does not defrag.. The Analyze works OK but not defrag. It gallops off doing a Calculating Disk Performance and stops there with a nice green GOOD. Clicking Defrag on the bottom button or Defrag Drive under Action makes it gallop off yet again to Calculating Disk Performance and no Defrag. If I View Files and check them, then hit Defrag Checked, it defrags them. But it did that before. I did as you highlighted, and bugger me, you are correct - sort of. I did the Analyse, hit Defrag, it built the file list then sort of hinted it was starting a defrag then stopped. Hitting the Defrag button again, and now it's actually defragging a measly 238 files. It did three files as I was typing that and then stopped. Hit Defrag again, nada, hit it again and now it's defragging where it left off. OK, that time it did one then stopped. Hitting Defrag, it doesn't, hitting it again, it does. Definitely not happy about something. Luckily I almost never use it that way so it ain't going to bother me. I normally go to File List, Analyse, sort by Size and select the first few screens of worst offenders and Defrag them then do the same for the Fragments column. Says Defrag Compete - wrong, it has done nothing, just another Health check. Conclusion - Defraggler does not work. Solution - Used [Moderated] for a perfect defrag with no problems. We've been unable to reproduce this issue using the default settings in Defraggler. 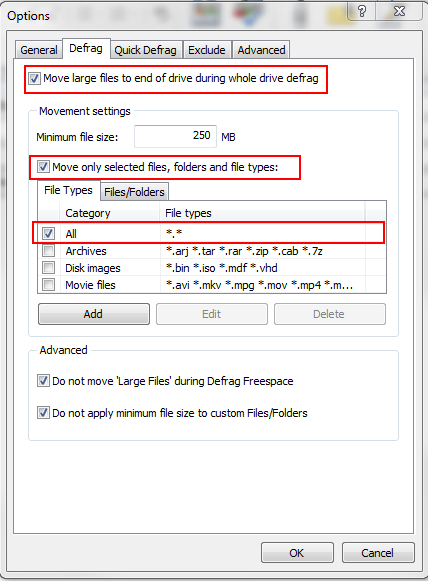 Please could you confirm if you have "Move large Files to End of Drive during whole drive defrag" enabled in Settings > Options > Defrag? I have that option set, with a 250MB minimum file size. Thank you for your comments. YES I do have that item enabled. Do you reckon if I uninstall Defraggler and re-install, it may cure the problem ? Thanks for providing that information. This is a known issue in the latest version of Defraggler. 1) Tick "Move only selected files, folders and file types"
3) Check this new category in the below box. I jumped the gun and uninstalled Defraggler using Revo-Uninstaller which scooped up all the leftover Registry items. I re-installed Defraggler version v2.19.982 and run it. Analyze first, then Defrag. It went fine with no problems. All OK now without needing any diplomas. Thank you all for your comments. Just one of those hiccups I guess, these things happen. What went wrong ? Only God knows and he `ain't telling. Experiencing same issue. Uninstall and reinstall did not rectify. Why would I need "Move large Files to End of Drive during whole drive defrag" checked if I didn't want that feature in operation. Neither that or the other solution of creating an "all" category work either. Also, Defraggler thinks 2 of my external HDDs are SSDs when they are not. new version released recently, do you have that one?